A compound found in buckwheat seeds extends the lifespan of worms, Vanderbilt investigators have discovered. They reported in the journal Aging that C. elegans worms consuming salicylamine — a compound that inactivates molecules called isoketals — live longer healthy lives compared to worms not receiving the compound. The findings support the idea that oxidative damage produced by compounds including isoketals contributes to aging-related tissue damage and death. Roberts, who is also the William Stokes Professor of Experimental Therapeutics, and his colleagues previously identified isoketals as products of lipid oxidation. The highly reactive isoketals are formed during normal cell metabolism, and they bind to and disrupt the function of proteins and DNA. Isoketal-modified proteins are increased in atherosclerosis, Alzheimer’s disease, hypertension and end-stage renal disease. 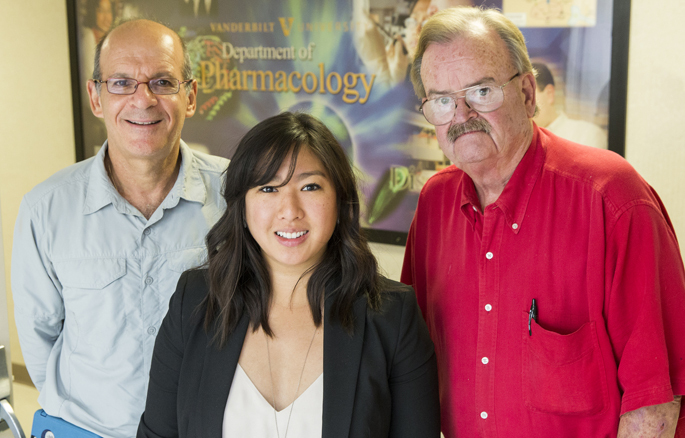 “With every breath, we’re generating molecules that can potentially damage us,” said Thuy Nguyen, Ph.D., who conducted the current studies as a graduate student working with Roberts and Michael Aschner, Ph.D., at Albert Einstein College of Medicine. Roberts and his colleagues had discovered that the natural product salicylamine scavenges reactive isoketals and prevents them from damaging proteins. In the current studies, the researchers found that treating adult worms with salicylamine increased the worms’ median lifespan from 16 to 25 days. They also demonstrated that the longer-lived worms were healthy. Salicylamine reduced the accumulation of fluorescent lipids — worm “age spots” — and slowed the age-related decline in pharyngeal pumping rate, a measure of food consumption. To explore how salicylamine extended lifespan, Nguyen and colleagues focused on molecular pathways implicated in longevity in C. elegans. They showed that the sirtuin SIR-2.1 was required for salicylamine action and that salicylamine works at the protein level rather than at the genome level. Future studies will focus on which proteins — in addition to SIR-2.1 — are being protected by salicylamine. In contrast to many studies, which have used genetic tools or altered developmental pathways to extend lifespan, salicylamine is a pharmacologic intervention that can be started in adulthood, Nguyen said. In previous studies, the researchers demonstrated that salicylamine prevented age-related deficits in working memory in a mouse model of Alzheimer’s disease. Mice consumed salicylamine for more than a year and did not exhibit any adverse side effects, Roberts said. Metabolic Technologies Inc., a natural products company co-founded by Vanderbilt faculty member Naji Abumrad, M.D., expects to market salicylamine as a natural supplement in the next few months. Roberts is convinced it will prevent oxidative damage and extend healthy life. “I think everyone should take this compound,” he said. Vanderbilt contributors to the studies also included William Zackert, James West, Ph.D., Shijun Zhu and Joshua Fessel, M.D., Ph.D. The research was supported by grants from the National Institutes of Health (HL121174, HL095797, ES010563, ES020852, ES007331), by a Parker B. Francis Foundation Fellowship, and by the Vanderbilt University Training Program in Environmental Toxicology (NIH grant ES007028).